My primary sources of exam prep material were a Microsoft Press book and a practice test. 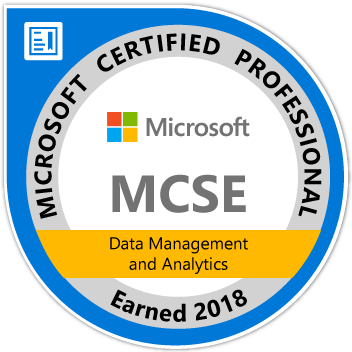 I've used books in the Microsoft Press Exam Ref series for three other exams and I was generally happy with all of them. My positive experience continued with the Exam Ref 70-767 Implementing a SQL Data Warehouse book, by Jose Chinchilla (b | t) and Raj Uchhana. As an MCP, I got a 50% discount on the eBook. (This may have been a temporary offer.) All-in-all, a great book at a great price. The practice text from Mindhub (MeasureUp) was a big help. It included 150 practice questions and a Practice Mode or Test Mode option when taking the test. The questions included in-depth answers to help you understand any questions you answered incorrectly (there were a lot of wrong answers on my part). It was clear to me that I had areas of weakness, including DQS. I was hoping to find a DQS video that used SQL Server 2016, but I didn't find anything that struck me as reputable. I did, however, find a good video Understanding SQL Server 2012 Data Quality Services by Lynn Langit (@LynnLangit). Thank you, Lynn! Another area where I got some extra help was SQL Server Change Tracking. This time it was Tim Mitchell (b | t) to the rescue. His video Managing Data Warehouse Incremental Loads with SQL Server Change Tracking is fairly recent, and really good. Thanks, Tim! As for the exam itself, (at the time of this blog post) the cost is $165. I found different pricing options for the practice test, with the cheapest option being $99. I usually don't buy practice tests until a week or two before I plan on taking the exam. When that time arrived, I noticed a bundle offer called Microsoft Exam Replay Plus with Practice Test. You get a voucher for any MCP exam, two retake opportunities (if needed), plus 30 day online access to a Mindhub/MeasureUp practice test. All for $265. This bundle made a lot of sense for me since I was going to buy a practice test anyway. The free retakes were a peace of mind. In all, the process spanned eleven weeks, which is on par with other exams I've taken. On paper, you'd think I could work through several exams in a year. But it's a challenging and somewhat draining experience. One exam per year (or maaaaybe two) is fine by me. Good luck to any of you that are on the certification path.